So ever since Heinze has been listening to the Serial podcast, he has been interested in a game called A Distant Plain. I had never heard of it, nor did I know of the existence of the COIN series by GMT Games. The COIN series are games that focus on guerrilla warfare and counterinsurgencies around the world. These games can be based on historical or ongoing events. Most of these games are hard to get your hands on: either you’ll have to pay a lot of money or you’ll have to be very very patient. You can buy A Distant Plain on e-bay for $195 or you’ll have to place an order the website of GTM Games. They’ll print new copies of the game once 500 people have signed up for a reprint. 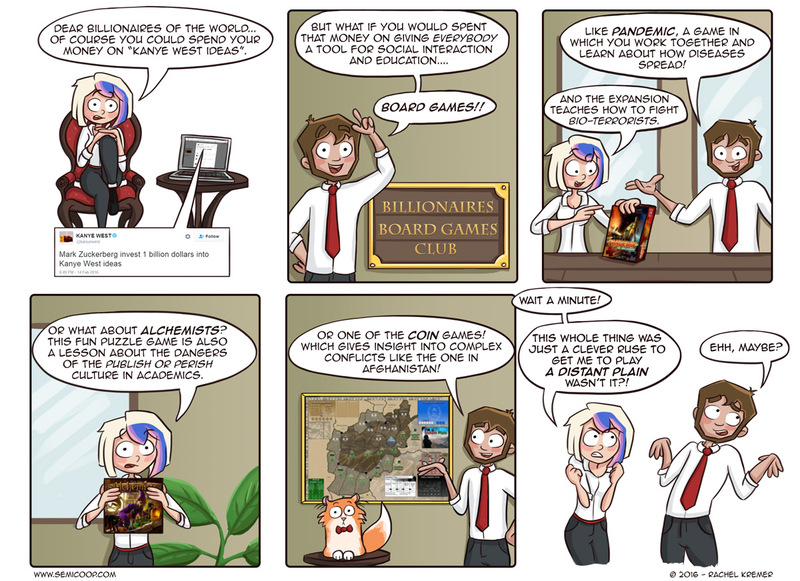 The idea of this comic was based on a Reddit discussion that asked the following question: ‘If you could give a copy of a single game to everyone in the world, which game would you choose?‘ We found that an intriguing question and would like to ask you to answer the same question. If you could give a copy of a single game to everyone in the world, which game would you choose? A serious answer would be one of the gateway games, Ticket to Ride, Catan, Splendor, Istanbul, etc, to show the world there’s a big world behind the classic boardgames like monopoly, risk, stratego and hope to make them craving for more. i had 504. its a great experiment. and can be used as a teaching tool to bordgame mechanics. I’m tempted to say Mage Knight, but then again, I’m lucky to have one four-hour block of open time in a month, so that wouldn’t work. So probably Dungeon Fighter, because I can’t imagine dropping dice off my nose will ever get boring. only 1 game…. thats a hard one, i take expansions dont count?. i would go with a gateway game. smallworld, ticket to ride. among those lines. It’s so different from the current mainstream games, yet so easy to learn and play (although coming up with a hint for your card can be hard for some). I have found that people who don’t usually play boardgames tend to like this one a lot! And if you really don’t like it, at least you have the pretty pictures to look at.